Despite what you may think, contacts can be useful for eye protection! Do you protect your vision while at work? Along with hand safety, hearing safety, and lifting safety, another essential element of staying safe on the job is proper eye protection. In this blog, we will delve into the hazards that can harm your eyesight while you’re at work, as well as the measures you can take to ensure your vision’s safety. Please read on to learn more! Here are some potential hazards to watch out for. Even in professional settings where construction or industrial work is not being performed, these hazards are still possible. For instance, in scientific research, various forms of PPE are just as critical. Chemicals: Both chemical splashing and fumes can affect your eyesight and damage your eyes themselves. Possible projectiles: Splinters, chunks, or dust from concrete, metal, and wood. Radiation leaks: Light, UV radiation, heat, infrared, and even lasers all present possible hazards. Bacteria, germs, and other pathogens: Blood and bodily fluids are a possible contaminant in any workplace setting. Be sure to especially protect yourself against hepatitis and HIV. Be aware of the possible and potential dangers to your eyes. Use screens, guards, or other protective measures. Always use the correct PPE for your eyes. Keep your eye protection in good condition and replace them if they begin to degrade or fail. 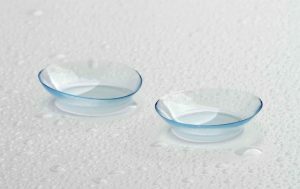 Are Contact Lenses Safe on the Job? You might think contact lenses can’t help protect your eyes while on the job. The fact is, there is no evidence of this assumption being true. There’s also no evidence they can harm your eyes, either. While there isn’t much in the way of substantial eye protection from the contacts themselves, they can improve vision for their wearers. This entry was posted on Wednesday, June 7th, 2017	at 1:31 pm	. Both comments and pings are currently closed.